Over 500,000 students have passed their exam the first time using CompuCram! 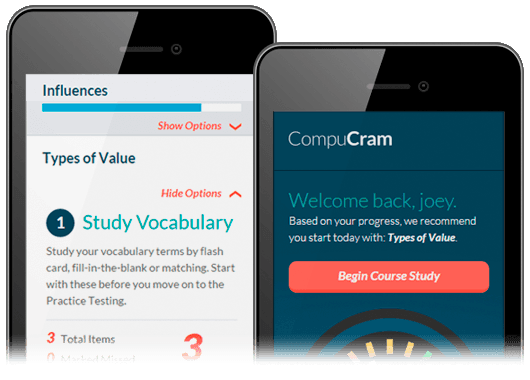 CompuCram is the only exam prep system available on the market today that integrates vocabulary tools, practice testing and comprehensive simulated exams into an “all-in-one” solution. The revolutionary new Readiness IndicatorSM gives continuous feedback as you study – ensuring that you pass the first time. 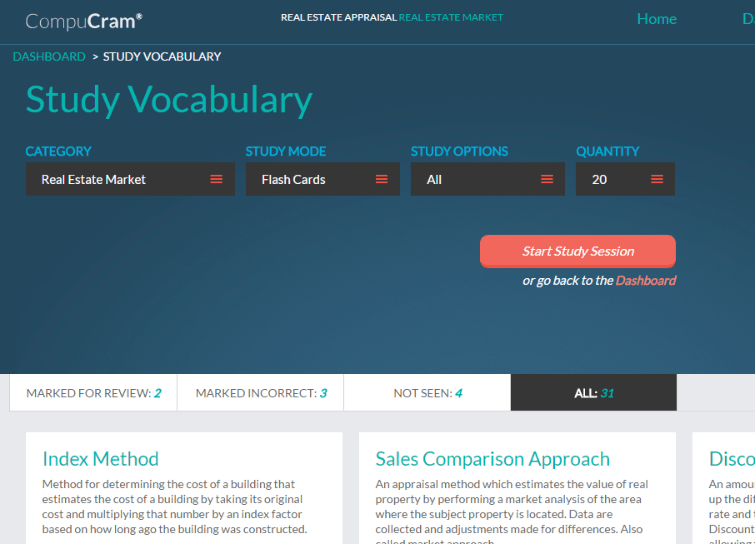 Study Vocabulary is the first step in our exclusive all-in-one exam prep system. Mastering the vocabulary will give you the foundation for understanding the exam topics and concepts. Explore different modes of study for different types of learners including fill in the blank, matching and flashcards. Our highly interactive system will help you master the terms and definitions you need to know so you are ready to pass the exam. Practice Testing is the second step in our all-in-one exam prep system focused on getting you comfortable to take the test. 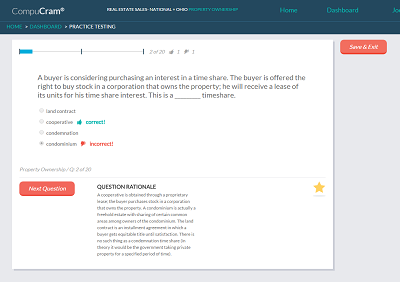 Our dynamic practice tests allow you to test your knowledge of the concepts you need to know in each exam category. No worrying about memorizing the answers here—our special technology ensures you will never see the same exam twice. Build your confidence through practice and develop an understanding of why each answer is correct. 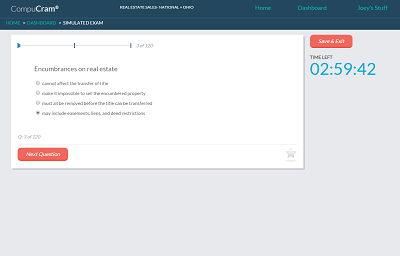 The third step in our all-in-one exam prep system is the Simulated Exam. This is where it all comes together! Our simulated exam mirrors the experience of taking the real thing! The exams are timed and feature the exact same number of questions in each category as the actual exam. 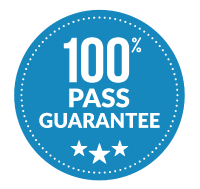 After mastering the simulated exam—you will be prepared to pass the exam the first time! Assess your knowledge with our exclusive Pre-Assessment. 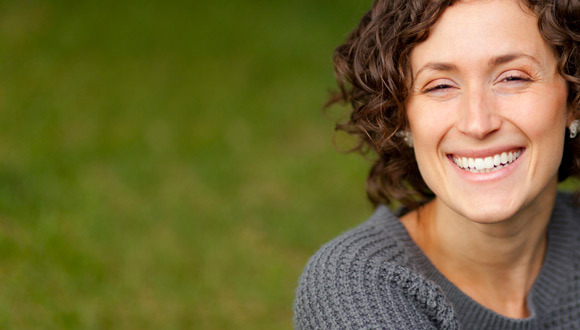 It is our free gift to you that will identify the areas you need to focus on. We will guide your study so that you can optimize your time with the most efficient studying possible. CompuCram features the most up-to-date questions available on the market today. We partner with local industry experts to write our exam questions so you can be assured they are relevant, current and reflect the actual state exam. Like how a speedometer reflects your speed, our Readiness IndicatorSM tracks your progress with the study vocabulary, practice tests and simulated exams. Get ready to rev your engine because our exclusive Readiness IndicatorSM will give you the green light when you are ready to take your exam! With a beautifully designed mobile and tablet-friendly interface, you can study and prepare for the license exam on any device - anytime, anywhere. The new CompuCram is ready to go wherever you take it, as long as you have an online connection. Our application was designed from the ground up to be mobile and tablet friendly - making it convenient to study when and where you want. Your study activity and results are always maintained, assuring that your work and progress are stored regardless of which device was being used. "CompuCram played a pivotal role in my passing the real estate exam. I would highly recommend to anyone who is contemplating a real estate license. The questions helped prepare for what "could" be on the test and also helped provide the knowledge needed in the real estate world."